Gold softened overnight in a range of $1325.20 - $1335.80. It failed to hold support at the triple bottom low at $1334-5 (4/12, 4/13, and 4/20 lows), the 50-day ($1333) and 40-day moving averages ($1332) and the up trendline from the 12/12 $1236 low at $1330 to reach $1325.20 – a 2-week low. Mostly long liquidation was seen. Gold was pressured by a stronger dollar, as the DX rallied from 90.32 – 90.73 (2-month high). The greenback found some buying over the down trendline at 90.48, and was bolstered by weakness in the yen (107.65 – 108.28, weaker Japanese PMI), the euro ($1.2285 - $1.2225, miss on Eurozone Manufacturing PMI) and the pound ($1.4030 - $1.3945). A rise in the US 10-year yield to 2.998% (4-year high) was dollar supportive, and rise in global bond yields also weighed on gold with the German Bund (0.603% - 0.639%), UK Gilt (1.49% - 1.53%) reaching 1-month highs. Global equity markets were a tad softer and a mild tailwind for gold with the NIKKEI of 0.3%, the SCI down 0.1%, European markets were down from 0.1% to 0.2%, and S&P futures were +0.1%. News that Kim Jong Un said North Korea would suspend nuclear and missile tests ahead of summits with South Korea and the US was also a bearish development for gold. US equity futures - which were in the red with other global equity markets for most of the night - turned positive (S&P futures to 2678) just ahead of the NY open, helped by an upgrade of Merck by Goldman and an upgrade of Caterpillar by Citi. The DX ticked up to 90.74, and gold slipped to $1323.90 – despite a miss on the Chicago Fed National Activity Index (0.10 vs. exp. 0.27). Later in the morning, a stronger reading on US Manufacturing PMI (56.5 vs. exp. 55.2) and Services PMI (54.4 vs. exp. 54.1) was followed by a better than expected report on Existing Home Sales (5.6M vs. exp. 5.55M). US stocks continue to climb into mid-day, with the S&P +13 to 2683 (consumer discretionary leads gainers). 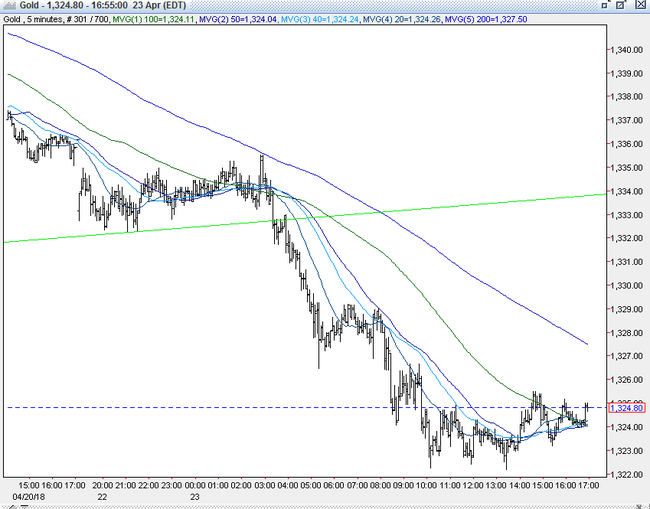 A rebound in oil (WTI from $67.11 - $68.75)aided the move. The US 10-year yield remained firm between 2.97% - 2.99%, and the DX reached 90.95 (3-month high). 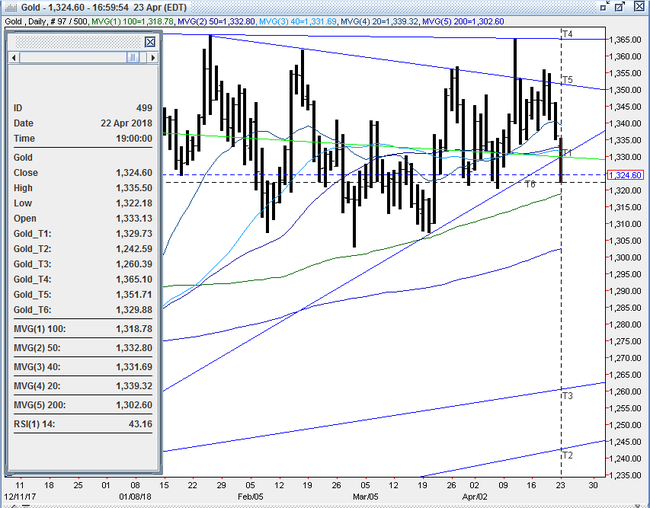 Gold sank further to $1322, where support at the $1321-23 (triple bottom, 3/29, 4/5, and 4/6 lows) held. In the afternoon, US stocks turned down, then finished unchanged at 2770. The 10-year yield pulled back to 2.966%, and the DX retreated to 90.87. Gold recovered to $1324.75 and was $1324 bid at 4PM with a loss of $12. Open interest was off 4.6k contracts, showing a net of long liquidation from Friday’s drop. Volume was lower but still very healthy with 301k contracts trading. Bulls are disheartened that gold has tumbled $34 in 3 sessions, moving from a potential major upside breakout to the lower-middle of the well-worn trading range seen since the start of the year. However, they still maintain the intermediate / longer term direction in the dollar is still down and will fuel future upside moves in gold. Also, they point to the favorable set up from the Commitment of Traders Report, and expect a rebound to challenge resistance at $1350 followed by the quadruple top at $1355 - 57 (3/26, 3/27, 4/18, and 4/19 highs). Bears remain comfortable selling into strength. They still believe a major bottom in the DX from 2 months ago is in place at 88.25, and expect its rebound to resume - especially after taking out the down trendline from the 90.94 March 1 high at 90.50 and reaching a 3-month high today. The bears are emboldened that support at $1334-35 and the downtrend at $1330 was breached, and will look for further long liquidation to take the market lower with a subsequent breach of the $1321-23 (quadruple bottom, 3/29, 4/5, 4/6 and 4/23 lows). Bears will then target the 100-day moving average at $1318 and then the $1307-10 (quadruple bottom – 3/16, 3/19, 3/20, and 3/21 lows). All markets will continue to focus on the volatility in the equity and bond markets, geopolitical events, developments with the Trump Administration, corporate earnings, oil prices, and will turn to reports tomorrow on Japan’s Leading Index and Machine Tool Orders, German IFO, US Case-Shiller Home Price Index, New Home Sales, Richmond Fed and Consumer Confidence for near term guidance. Gold prices to push past $1400 by 2019 – Murenbeeld and Co.